According to Canalys estimates, worldwide cybersecurity spending exceeded US$10 billion for the first time in Q4 2018. Organizations increased their level of protection against malicious threats, while adhering to strengthening data compliance regulations. Total cybersecurity investment in 2018 reached US$37 billion, up 9% from US$34 billion in 2017. Despite the high priority many organizations give to protecting their data assets, endpoints, networks, employees and customers, cybersecurity still only represented 2% of total IT expenditure last year. This will inevitably rise as new, more frequent and sophisticated threats emerge, which will give vendors further growth opportunities. By 2020, total cybersecurity spend is expected to surpass US$42 billion on an annual basis. “Over the next two years, the transition in cybersecurity deployment models will accelerate. Customers are changing their IT buying behavior, with the adoption of public cloud, and flexible consumption and subscription services,” said Canalys Principal Analyst Matthew Ball. Canalys data shows that in 2018 traditional hardware and software deployment accounted for 82% of the cybersecurity market. The remaining 18% was deployment of virtual appliances and agents, procurement through public cloud marketplaces and subscriptions to cybersecurity as a service. 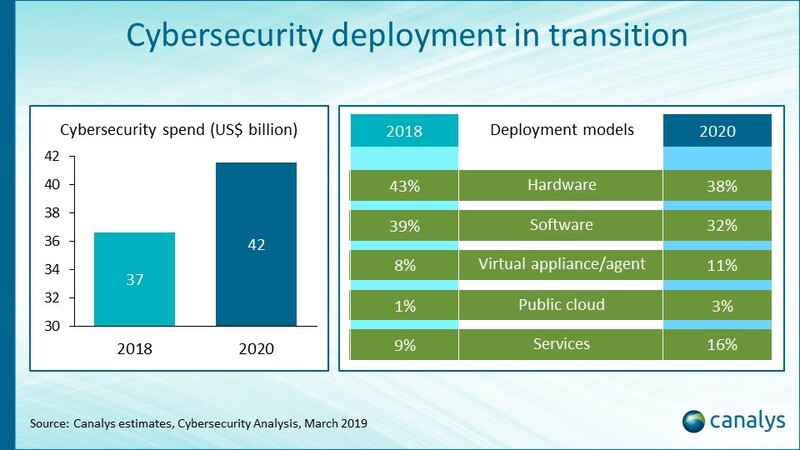 “The leading cybersecurity vendors have embraced new deployment models, with each in the process of transitioning their businesses to more subscription-based revenue and increasing transactions via cloud marketplaces,” said Canalys Research Analyst Ketaki Borade. In Q4 2018, Cisco remained the overall worldwide market leader, growing its share from the previous year to just under 10%. 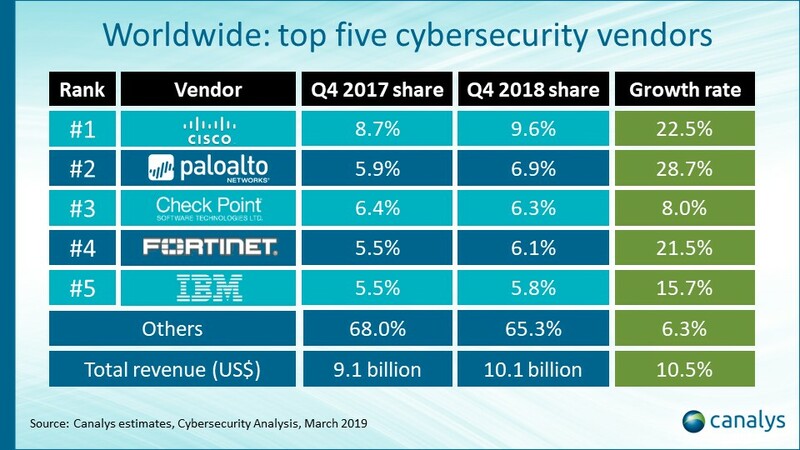 Palo Alto Networks grew faster but remained in second place with 7%. Check Point, Fortinet, IBM and Symantec each had 6% market share in Q4. Overall, the top 10 cybersecurity vendors collectively represented 53% of shipments during this period, with the next 20 accounting for 21%.